Love is beautiful, love is fun, love is sacrificial and love is expressive.How far will you go to show your love? ‘Vitamilk Love Night,’is an annual event organized by the “Ahyesi’ hitmaker that gathers couples,loved ones, and his cherished fans to a night of bliss, love,drama,resplendent music and dance to celebrate the love season. 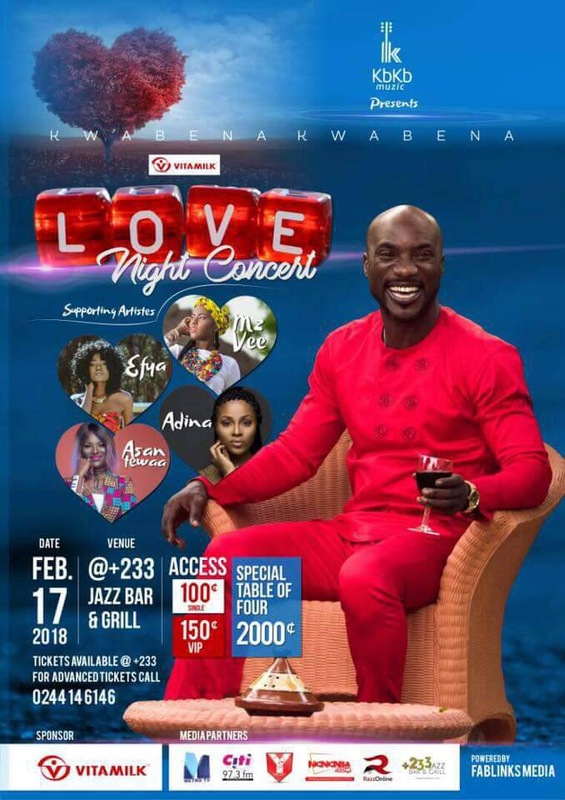 Throwing more emphasis on the event, the manageress of Kwabena Kwabena,Frema Ashkar indicated that,”This year’s edition promises to be exceptional…Over 500 couples are going to be hosted on the night and will experience different kind of love concert in a romantic atmosphere.the rate for the event will going for GHC100 regular,GHC150 for VIP and the special valentine table going for GHC2000”. Frema explained further that,”The special table for 4 people going for GHC2000 comes with a special Valentines package which include meals and Champagne. The program which is sponsored by Vitamilk,will witness seasoned artists like Efya,Adina,Mzvee and Asantewaa joining Kwabena Kwabena to thrill fans with electrifying performances. Kwabena Kwabena is currently out with his 5th album ‘Ahyesi’ .Songs on the ‘Ahyesi’ album include:Tuamudaa,Obi Asa,Ensesa,Adansie,Adonai,Matwen abre ,Yedo Ye ho,Obaa and Siwagede.